Hollywood Week is a week away, the new season is almost upon us, and we’re busy tooling up for season 12. I just wanted to preview what’s going on. My emphasis this year, as opposed to prior years, is going to be to provide a real prediction model. This will be fully (painfully, perhaps) detailed in an article to come. The short version is that a lot of effort went into crafting a much more robust, hopefully much more accurate statistical model for week-to-week predictions of who the bottom 3 will be, with good error estimation to quantify how much uncertainty there is. I’ve also built a horserace tracking model that is quite good at predicting who will make the Top 3, which is much less noise prone than the week-to-week predicitons. Finally, a similar model to that for the finals has been built for the semi-finals, and I’ll be tracking the tangible variables that go into this model throughout the audition episodes. I’m switching the blog over to Disqus for commenting. My hope is that this will have some effect on the level of discourse and require less moderation. There may be some hiccups with this, so let us know on our Facebook or Twitter if something is awry. I’ve also incorporated JQPlot into the site, which will provide not only really spiffy plots, but also ones that are interactive and more informative. Again, if these plots don’t render correctly, please let us know. Point of correction, though. I said “idiots like me”‘ not “people like me”. Unlike last week, the numbers haven’t moved overnight. Phil is predicted, with 72% chance, to pack it in tonight. It will be interesting to see whether that happens. I would note quickly that Hollie has been underperforming her numbers, so it’s possible the model is getting this totally wrong. Recall, dear reader, that the very song she sang first last night (River Deep – Mountain High) was the song Pia sang when she was eliminated. Here are the current values for the contestants on Intrade. They view DeAndre as the least likely to win. 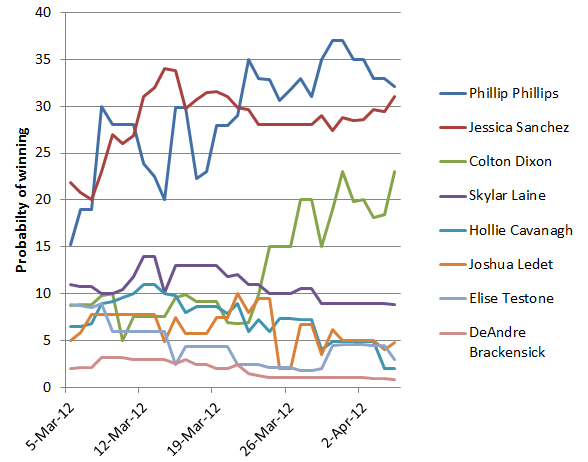 Colton seems to have done himself a world of good in the past few weeks, nearly doubling his chances. Though his stock is not priced as highly as Phil or Jessica’s, it likely will be if he continues to be one of the 3 people who have never been in the bottom 3.